The ethnic composition of the "Wu Hu" (The five foreign tribes that invaded China during the Jin Dynasty) remains much riddle. But according to Chinese ancient historical annals, the Xiongnu are a tribe with red hair and blue eyes like the "Wushun". And, Jie, which was a branch of Xiongnu, was also described as having high nose bridges, and "deep" eyes. After the collapse of their rule of the Han, the Jie people was distinguished easily because of their Caucasian features and slaughtered (more than 200,000 victims). The historical work of the later dynasties also described the remaining Xiongnu people as having "long nose" and "yellow hair". Until the Tang dynasty, the "Ji Hu", who were the offspring of the royal Xiongnu people, were still called "Hu tou Han se" (Hu head and Han tougue) which means they adopted the Chinese tongue, but still retained "foreign" features. Much other evidence can support the standpoint that Xiongnu are Caucasians, I don't need to illustrate further. Some people believe the Xiongnu are a Mongoliod race, because Roman historians said the Hun people who invaded Europe had "brown skin, stocky bodies and slanting eyes". But, actually, the Hun who invaded Europe 5th century were not the descendant of the Xiongnu. The contemporary scholars affirm they are the same tribe just because the pronunciations of "Hun" and "Xiongnu" are approximately the same. And there is some relationship between their languages. I also want to point out that around the 5th and 6th century, there was another branch of "Hun" which ravaged the Persia and Northwest India; that branch was called the "White Hun". The Persian historian said that they were white and their features were different from "Hun". Hence, it seemed that they were also Caucasian. Now, let's come to the Xianbei. Many people noticed that, in history books, the Xianbei people were called "Bai Lu" means "white invader (thief)". And in the Great Work Zhi zhi tong jian, I found the following story--The Emperor Of Eastern Jin, Jin Ming Di (Shima Shao), had yellow beard and hair, because his mother was a Xianbei female. Once he went to inspect his troops without notice, and his warriors all thought he was Xianbei and chased him as an enemy. The folk songs at that time said, "Huang tou Xianbei jin Luoyang" - "Xianbei with yellow head enters Luoyang". Xianbei is described with "yellow head" and it is quite possible that "yellow head" referred to their yellow hair and beard. Xianbei is an alliance of tribes; there might also be some Mongoliod tribes in it, but the Caucasian elements were more obvious, since all Hans paid attention to it. The contemporary Chinese people don't dwell on the ethnic origin of their nation. Most of them believe they are simply of Mongoliod race. That's not a correct concept. The racial intermix in China began before any dynasty, in the Neolithic age. The skulls unearthed in the relics of Banpo Xi'an revealed Caucasoid traits, more specifically, the Nordic Caucasoid. The Banpo civilian used to be Nordic and Mongoloid hybrid (like the Finns today). We all know the Banpo is the representative civilization of the Northern China Neolithic civilizations. It is possible that many other northern Chinese civilizations in that time were created by Caucasoid or mingled people. The Hemudu in Zhejiang is the representative Neolithic civilization in southern China. After scientists measured the skulls found there, they found that they have Negroid characteristics! One renowned Chinese anthropologist stated in his work that "According to the numerous skeletons of Indo-European people unearthed in China and the features of the southern Chinese people today, the Chinese nation can't be classified solely into the Mongoloid race." Earlier, many Chinese anthropologists also clarified that it's completely wrong to say the ancient skeletons discovered in China belong to the same race. Another famous event at the end of the 20th century also supports the idea--some biochemistry researchers analyzed the DNA from the mummies in some ancient tombs in Shangdong province, and made a conclusion that these DNA correspond that of the European people. Other research discovered that the genetic makeup of northern Chinese is closer to the Caucasoids than that of the southern Chinese. The origin of Zhou, the third dynasty of ancient China, is also doubtful. The time of the establishment of that dynasty is not far from the time of Aryan Expansion. The chariot used by the soldiers of Zhou resemble the chariot used by Aryan invaders to India! Moreover, the ancient Chinese work written by Mengzi said that, Zhou Wen Wang (the emperor of Zhou) was of the people of the "western barbarians". It's quite possible that a branch of Aryan entered China at the time of the migrations of Aryans. The people of the preceding dynasty, the Shang (1766-1100 B.C. ), were described as having dark skin and wooly hair. Neither the Zhou or the Shang were true empires (the first Chinese empire was the Qin). At that time, many different kingdoms existed in what is today's China. The kings of these nations swore allegiance to a common "emperor" (the reigning king of the preeminent kingdom), but retained their political automony. Unlike China today, which is a single political entity, pre-QIn China was a loose union of different nations (which scholars consider dukedoms or kingdoms). According to Chinese legend, the despotic last king of Shang (the acknowledged emperor), invited the crown prince of Zhou, one of the kingdoms in the Chinese union, to visit his kingdom. Instigated by his evil concubine, who was angry with the Zhou prince for rejecting her advances, the emperor Shang Zhou Wang ordered the prince of Zhou to be ground into meat paste, made into meat patties and sent back to the Zhou kingdom for his father's consumption. Outraged, the younger brother of the murdered prince took the story of Shang atrocities to other kingdoms in the Chinese union and mobilized a multi-national rebellion to attack the Shang kingdom. Shang citizens tired of the arbitrary cruelties their monarch visited on innocent Shang people also joined the rebellion. After the Shang was overthrown, the Zhou was acknowledged as the pre-eminent kingdom and the younger Zhou prince became the Zhou emperor. These fantastic stories are retold in the legendary Fengshen Yanyi - "How Heroes were Deified". The Fengshen Yanyi had even captured imaginations beyond China and was made into a Japanese animation series. Some even cast doubts on the origin of the Qin Dynasty, which was the dynasty which followed Zhou. At least, there were some Aryan tribes which were not absorbed by local Chinese still existing in western and central China at the time of the late Zhou dynasty. It was recorded that the king of Qin attacked the ruler of Zhou with some barbarous tribes but failed. That event happened a few hundred years BC, at that very time the Bactoria in Central Asia was conquered by 4 Nomadic Aryan tribes. The origins of 3 of these tribes were definite. Now, some historians reckon the 4th tribe might be the Aryan tribe that moved back to Central Asia. Until Han dynasty, the "Yue zhi" (pronounced as 'rou zhi'), an Aryan Tribe, still lived in Ganshu province, and sometimes the track of their activity can be found in northern China. And the region east of Tianshan (in the center of East Turkestan) was populated by Saka (a branch of Aryan, whose language belongs to the Iranian group, known as 'Scythians' to Westerners and 'Sai Zhong' to the Chinese). Now, many scholars believe that many "Yi" and "Di" (the diverse barbarian tribes) recorded in early Chinese dynasties were Caucasoids. The origin of the Xiongnu can probably be traced back to Scythians because records revealed that their customs were the same. Caucasoids also inhabited other parts of East Asia since early times. In Japan, the aboriginal Ainu people was finally confessed as the ancestor of current Japanese nation. The Ainu were a Caucasoid/Negroid tribe which moved to the Japanese islands more than 20,000 years ago, while the Mongoloids reached Japan only about 10,000 years ago. They intermixed and yielded the contemporary Japanese people. The same procedure of intermixing also took place in Korea. The great ancient Chinese culture was a furnace to integrate all races. The Mongoloid types can't be regarded as the only "local Chinese". Caucasoid and Mongoloid elements created the grand Chinese civilization together. Most of this article is untrue. Refer to my post about ancient central Asian genetic markers in the genetic section. There is no trace of 'White men' whatsoever in ancient China. The territory of Xinjiang, i.e., New Dominion Province, is a disputable area. Sima Qian could be wrong in assuming that Yuezhi people had lived around Dunhuang-Qilian. The mummies were found near Turpan or Urumqi. In history, true, Ran Min had killed 200,000 Jiehu for their high nose bridge in 3-4th century time frame. Jiehu was merely one branch of the Huns, but the rest of Huns were just like us Chinese. That's why history said Jiehu was sorted out by high nose bridge. High nose bridge was not equal to White men. You had seen Indians, Pakistani, and Afghanistani. They all have high nose bridge, but they are not White men. People in Xinjiang, Afghanistan and Pakistan have relatively darker skin, the same way as Tibetans: Because they live on higher grounds, and because they live next to the desert. Similarly, hairy skin was not equal to White men. I had pasted a picture of the Ainu on my website at http://www.uglychinese.org/japanese.htm Once you see who the Ainu are, you understand what I mean. I had a discourse on Tanguts, Qiangs [Tibetans], and today's Yi-zu minority. There were extrapolations about them. Epics claimed they pasted red color onto dark face. Should they have high nose bridge, that's because they, either relatives or ancestors of Tibetans, had historically lived in between Chinese and Xinjiang [New Dominion Province]. Shallow-minded and opportunist Chinese, who never hesitated to be a traitor since the Opium War of 1839-42, had speculated a purported link to non-Mongoloid on basis of incomplete analysis of Linzi DNA on the tomb remains of people living in Shandong Peninsula 2500-3000 years ago. Such racial demeaning approach led to claims that ancient Rong-di people were non-Mongoloid or that ancient Chang-di barbarian & Zhongshan-guo people were non-Mongoloid. A thorough perusal of ancient history only leads to one conclusion, i.e., ancient Rong-di people and their offsprings were ancestors of today's Tibetans. Emperor Fu Jian of Anterior Qin Dynasty (AD 351-394) called the Xianbei rebels 'Bai Lu', namely, "light"-skinned enemies [as commonly perceived]. Historians, including Cai Dongfan, speculated that Xianbei, whose ancestors fled to Manchuria under the Hunnic attack, MIGHT have possessed lighter skin; and a Japanese historian, who compiled China's 25 chronicles into commonly-readable series, had also pointed out that Jinn Dynasty wealthy in northern China liked to buy Xianbei women as concubines for the height. Having interpreted "Huangxu-nu of Xianbei" as "yellow-haired slave of the Xianbei nomads", I would conclude that <b>Xianbei 'Bai Lu' could merely mean white-colored clothing people by adopting Scholar Wang Zhonghan's linkage of ancient Bai-yi [White Yi] subgroup of Dong-yi [Eastern Yi] barbarians</a> to the tribal custom of wearing white-colored clothes.</b> In deed, today's Koreans, i.e., kinsmen of the Tungunzic Dong Hu, still had a tradition of wearing white robe. This message was sent from: Chinese Culture Forum at Asiawind. I think all these arguments on (Han) Chinese origin are avoidable. Historical records, including ethnic demographic history, are likely to be some times imprecise and inconclusive. This leads to much controversy and speculations. Paleoanthropology offers some insight and genealogy can contribute. But, as genetics and paleo-genetics can provide more accurate answers, these should be the main focus. This is not to negate others as mentioned. They are still relevant to compliment the genetic analysis. quite different. The indigenous mitrochrondial DNA (female lineage) contribution to the Brazillian population varies from 11% to 59%. And the excess native women were taken advantage by the predominantly male European immigrants/invaders. It was also possible that the native women preferred male European for survival reasons. This contradicts the current academic apology that depopulation of the natives was the result of diseases or lack of immunity to introduced diseases. Diseases do not discriminate (whether you are male or female). This aside, there are now enough genetic studies to answer this question about (Han) Chinese origin. Perhaps, if all the Chinese ethnic groups are to be considered, more comprehensive and representative data are needed. conclude that there are no European/Caucasoid genes in the Han Chinese. It is easier and more definite to disprove substantial Caucasoid genetic component in all Han Chinese. Also if there is any truth that there is Caucasoid origin to Chinese, then significant amount of Caucasoid mitochrondia DNA (female line) and Y chromosomal DNA (male line) has to be present in all the Han Chinese. minorities (eg Tibetan) are more related to the Han than the Caucasian or other minorities (eg.Kazaks) that have significant amount of Central Asian genes. To track down the more closely related ethnic groups, more samples (larger number of people from each group) and genetic markers have to be analysed to reveal the minor differences. This is simply because it is harder to differentiate individuals who are more alike genetically. Besides, interbreeding over the years further compromised the differences and so complicated the picture. (Ref 4,5) The following references used for this posting are available from website like www.genetics.org Reasonable knowledge in genetics is required to read and understand them. High nose bridge was not equal to White men. You had seen Indians, Pakistani, and Afghanistani. Well, they are not Mongolid and AT LEAST Europid (Caucasoid) and in that sense "white". Furthermore we know from the mummies and the settlements that there were different waves and types of "Aryans" or better Indoeuropean speaking Europids in Eastern China. In history, true, Ran Min had killed 200,000 Jiehu for their high nose bridge in 3-4th century time frame. Jiehu was merely one branch of the Huns, but the rest of Huns were just like us Chinese. That's why history said Jiehu was sorted out by high nose bridge. High nose bridge was not equal to White men. You had seen Indians, Pakistani, and Afghanistani. They all have high nose bridge, but they are not White men. People in Xinjiang, Afghanistan and Pakistan have relatively darker skin, the same way as Tibetans: Because they live on higher grounds, and because they live next to the desert. Similarly, hairy skin was not equal to White men. I had pasted a picture of the Ainu on my website at http://www.uglychinese.org/japanese.htm Once you see who the Ainu are, you understand what I mean. Emperor Fu Jian of Anterior Qin Dynasty (AD 351-394) called the Xianbei rebels 'Bai Lu', namely, "light"-skinned enemies [as commonly perceived]. Historians, including Cai Dongfan, speculated that Xianbei, whose ancestors fled to Manchuria under the Hunnic attack, MIGHT have possessed lighter skin; and a Japanese historian, who compiled China's 25 chronicles into commonly-readable series, had also pointed out that Jinn Dynasty wealthy in northern China liked to buy Xianbei women as concubines for the height. Having interpreted "Huangxu-nu of Xianbei" as "yellow-haired slave of the Xianbei nomads", I would conclude that <b>Xianbei 'Bai Lu' could merely mean white-colored clothing people by adopting Scholar Wang Zhonghan's linkage of ancient Bai-yi [White Yi] subgroup of Dong-yi [Eastern Yi] barbarians</a> to the tribal custom of wearing white-colored clothes.</b> In deed, today's Koreans, i.e., kinsmen of the Tungunzic Dong Hu, still had a tradition of wearing white robe. What do you suggest most Afghanis and Pakistanis are? East Asian, as in Mongoloid??? Western China was inhabited by white men (ie. European physical types) and many of these people spoke Indo-European languages. Last edited by Polak; Friday, December 24th, 2004 at 04:44 AM. Eastern China was inhabited by white men (ie. European physical types) and many of these people spoke Indo-European languages. The groups you talk about never touched the real China, really, and they only had contact with Chinese civilization historically, way after the Indo-European expansion. China only recently extended the borders to include the extreme west, which is separated from China by the Taklamankan and Gobi desserts, some of the most inhabitable terrain on earth. The only way from western Eurasia and eastern Eurasia is by Siberia or SE Asia, because the middle part is blocked off by a continuous wall in the Hindu Kush, the Himalayas, the Tien Shan, and the Atais.. though the last one is traversable..
Northern Paladin: I managed to read the first paragraph of your post. Yes, some of the nomads were Indo-Europeans (Tocharians, Wusun, Scythians..). Most of the people you talk about were northern Mongoloid nomads and had nothing to do with Caucasians. 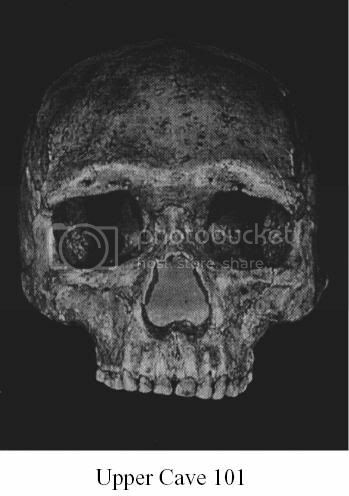 If this is about atlanto-med's contention that there were Caucasian skulls in China, this is your "Caucasian". It's an "australoid" found as late as 10,000 in northern China. It has certain generalized characteristics that can be clustered with ancient people of the Middle East/lower Europe/India. This place is beginning to look like StormFront by the day with this "educated" appropriation. Last edited by Test; Thursday, December 23rd, 2004 at 11:14 PM. Well, I'm not sure about the desert, because there were more oases there in the time of the IE expansion. But how would you say that the horse, related tactics and transport, came to China? Via Turkic and Mongol people which took it over from IE or direct contact (more likely so from what we know so far). I mean so far we cant say with any real certainty how far the influence was going, but we just cant rule an influence out, especially if you look at the region and see the contact. The core of China might have been never in direct contact, but over the border regions contact seems to be very likely and so are influences probable as well. But I thought this thread was about how Caucasians created Chinese civilization or how there were Caucasians in China that were replaced by austros or Erectus.. so maybe I'm talking to the wrong question. If, we just talk about certain stages and parts of it which were formed by Caucasoids at least "as well". Civilizations have always been influenced and borrowed from one another. No Civilizaition owed all it's innovations soley on it's own creativeness. I don't see why admitting that there were Caucasian elements in China is equalivent to admitting that Caucasians were responsible for Chinese Civilization. Surely they were not. Though they may have influenced it. Take the horse or Iron making. It's more than probable that there was at least some Cacausian influence in China Via Nomadic raids,migrations, and trade(silk road). It's still evident in the Modern Chinese population. Especially in Western China one can see people with certain Caucasian and even Nordic features. Like high bridged nose and fair hair and eyes.